Gestural interfaces normally rely on cameras and light sensors. 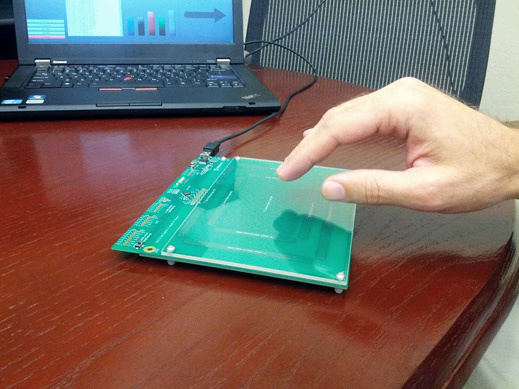 An interface that uses an electric field instead could expand the use of gesture control to many more devices. And now, there’s a new chip that will bring 3D gesture control to smartphones. This week, Microchip Technology, a large U.S. semiconductor manufacturer, is releasing the first controller that uses electrical fields to sense 3D hand movements. The low power chip can recognize about 1o predefined hand gestures within a 6″ range. Perhaps most interesting, the controller could easily go into electronics that don’t have a camera, including car dashboards, keyboards, light switches, or a music docking station. The technology could create some interesting ‘noise’ similar to people walking around city streets talking to themselves on hidden cell phones. In the near future, drivers waving their hands wildly, may simply be changing their music channel on Pandora. Thanks for reading and subscribing to FormFonts 3D Models. This entry was posted in 3D Tech, Augmented Reality, Reality Hacking, SketchUp and tagged 3D Gesture control, 3D positioning, MicroChip Technology, MIT Tech Review, mobile gesture control, natural UI, no camera gesture control, Pandora. Bookmark the permalink.